How's A Girl To Vote? Women all across this great country were supporting Hillary Clinton for president, but now that she has given up her campaign, who will those gals vote for? Sarah Haskins from Current.com examines how our remaining candidates are marketing themselves to the ladies in this installment of the "Target Women" videos. 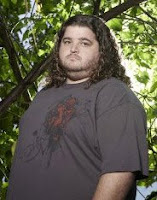 I posted a comment today on Jorge Garcia's blog. I'm practically beaming about it. I wanted to tell all my friends about it, as if I had had just had lunch with him instead of putting one of scores of posts by fans about a quick thought he put on his blog. But that's not the geeky part. I actually spent quite a bit of time thinking about what I was going to say, as if he would read the comment, think to himself, "hey, she seems like a cool chick, I should see if she has a blog." And then he goes to it, posts something to me and the next thing I know he and his girlfriend are joining me and my husband for yard sale-ing and sushi. Which is ridiculous. My husband doesn't even like sushi. It's just one more example that proves I need to stay away from celebrities. I can't handle it. The time I met "Weird Al" Yankovic I was a mess. We had gone to his show in a small venue near here and there we ran into a comedian friend, who, it turned out was friends with Weird Al's bass player, Stephen Jay. He got us backstage and said we could meet Al. That eventually became something like two hours later, because Al kept inviting in people waiting for autographs. That man does not like to disappoint his fans. Anyway, what we thought was going to be "hanging out with Al" turned out to be "when the line starts to taper off you can get in it after that bunch of ten year olds and get his autograph." When we got up there, Paul was cool and calm, shook his hand, told him how much he enjoyed his work and thanked him for the autograph. My few moments with him were like a blur. I think I tried to launch into a stammering story of how we had sung "Amish Paradise" at a karaoke bar a few weeks earlier then decided that was a stupid story so I tried to change gears in the middle of it and it came out something like, "Uh, Hi, Al, um, Weird Al, we love, I mean I love your songs, we did the Amish... thing, um, I love you, I mean your work and uh, thanks. For the autograph I mean. And the music. And um, also, uh, the music too. Thanks." I'll say it right here: "Weird Al" Yankovic has some serious patience. He just smiled at me with great understanding, and no sign of irritation, as I backed out of the room, tripping over ten year olds. Someday I'll tell the stories of when I spent the day with A. Whitney Brown and spoke on the phone with Tucker Carlson. Do you watch Big Bang Theory, Dharma and Greg or Two and a Half Men? Have you ever noticed for like a split second at the end of every episode there is a flash of something written in black on a white background and you may not be entirely sure you saw it unless you can back it up and pause it? Well, those are the "Vanity Cards" of writer/producer Chuck Lorre. Some of them are funny, some of them are downright bizarre, but they still invoke quite a bit of interest in those that catch them go by so briefly. Those of you without TiVo or On Demand who are overcome with curiosity can fret no more. You can read all those cards, for all of Lorre's shows, here. I thought I'd throw out a quick explanation and then give the occasional update. I started this blog because not only have I wanted to for some time, but because at the moment I am laid up post-surgery. My achille's tendon was repaired and it takes a long time to get back on one's feet, or in this case foot, after such an operation. This week I am walking around more but probably shouldn't since I think I might be stretching the incision. I have been getting a world of help from a great lady named Bridie. She has been a God send, especially for my four year old, Cameron. I can live with sitting back and watching daily courtroom reality shows while surfing the net and healing, but my son has been bored to tears. To counteract that, Bridie gets him outside as often as the weather allows. Today they went on an adventure. My son loves motor vehicles of all kinds, and trains in particular. So Bridie took him on the bus to the subway station, then transferred to a trolley. ("That was my first street bus I ever been on!" -Cameron) They got off somewhere (you'd think I would have paid better attention to their schedule) and had ice cream, chased pigeons, got back on board the trolley and made their way home. Doesn't sound like much to us, but he came home full of that enviable 4-year old exuberance and told the story of their day in breathless spurts of sentences that ended up having to be translated by Bridie. I am so glad they had fun. My Top Ten Favorite Moments of the Lost Finale. On this Father's Day, I would like to share the top ten things I love about my Dad, L. Cameron Hyers. Number 10: Made me animal shaped pancakes. My parents divorced when I was pretty young, and it wasn't an amicable split by any means. Their relationship post-divorce was strained and imperfect, and we didn't see him every weekend like some kids got to do. But when we did see him, he went that extra mile for us, making it special, but not in that "if I buy my kids a lot of the crap they want they won't hate me" way. It was special in the little things things he did, like trying to make me the unicorn shaped pancake I requested even though thats really hard to do. And now, it's something I do for my son. But I only make Mickey Mouse shaped heads because I have a mold. Hey, Daddy didn't raise no dummy here. Number 9: Didn't make me get a summer job. The summer I turned sixteen I was living with my Dad and stepmother. Around that time, my stepmother asked me when I was going to get a job. When I stammered that I really hadn't thought about it, my father spoke up and said he didn't think I needed to. He pointed out that I had the whole rest of my life to work, so why shouldn't I get to enjoy the summer like a kid should? We prevailed and I got that summer off. How cool is that? And the next summer, when the argument didn't work, he drove me to my job every ridiculously early morning, and picked me up every afternoon even though he had to interrupt work to do so. Number 8: Taking care of his mom. My grandmother was not what you would call, um, "easy to get along with". She was quite difficult and opinionated, and that only got worse as she got older. She lived on the opposite coast from him, and he often flew back and forth tending to her almost pretty much every time she demanded it. He also made sure she was in the nursing home that she wanted, even if it meant moving her back and forth until she decided which one that was. He spent a lot of money doing that, money that I know he could really have better used in his retirement now. Number 7: His boyish enthusiasm. Whenever my Dad finds something that he likes he gets so excited about it you would think he just discovered a new way to slice bread. If it's on the TV or the radio he will tape every show and play back the highlights to us as he explains what he loves about it. Which sometimes gets comical as he gets so enthusiastic telling us how much he loves it, that we miss it and he has to rewind it and restart it. And more often than not, he talks so much about how he was talking about it that we have to rewind it yet again. It is truly infectious. Number 6: His support of me and my husband as comics. When I first started doing comedy, approximately two months after I first set foot on stage, I went to see my Mom in Tucson. When I talked to my Dad before the trip he mentioned he was also going to be in Tucson around the same time. Meanwhile, I was encouraged by some of my Boston comedian friends to try to get a set at the Tucson comedy club Laff's, so I mustered up the courage, called and got a guest set on what turned out to be the same day my dad was arriving. In order to see his little girl perform this barely five minute guest spot my Dad, as soon as he landed at the airport, rushed to rent a car, rushed to his hotel, changed, rushed to club and then bought his ticket at the door even though I had left his name at the door and made it to his seat pretty much as they were lowering the lights. That happened in 1993. If you ask him about it today he can still tell you about that set and the set of the other comics on the show that night. Not only that time, but after I met my husband my Dad would go to as many shows as he could with us, tape them and I think he still listens to them to this day. He remembers more of our old jokes than we do. Number 5: My Dad is an amazing artist. I have paintings he gave me all over my house and I am so proud when visitors come and admire them and I get to say, "My dad did that, and all the other ones here as well." This is one of my favorite paintings by my Dad, and it hangs proudly in my living room. He takes such joy in his painting. Sometimes I wish he would be "discovered" and he would gain the great amount of fame and fortune that he truly deserves, but on the other hand I would hate for his painting to become a chore or just a job. Number 4: Nobody is a stranger to him. My Dad is one of the friendliest people you'll ever meet. He can go anywhere and strike up a conversation with anyone, about just about any subject. I remember well the time I asked for, and got, a trip to New Orleans for Christmas. My school was in the Sugar Bowl and my friends and I all wanted to go and see the game. So after Christmas, to get ready for my trip, my father and I spent the day doing errands like getting traveler's checks, getting a new pair of glasses and other stops for him as well. At every place we stopped at, just after we handled whatever errand it was and before leaving he would say to the person who waited on us, "My daughter's going to the Sugar Bowl." I, of course, being a teenager, rolled my eyes thinking he was annoying the clerk. But no, the statement always led to some kind of conversation about something, whether it be football, college, or just traveling. And they all enjoyed themselves immensely. Number 3: Introduced me to great comedy. I credit my dad for my love of comedy. He has an amazing collection of old time radio programs. Back in the days before the internet and Time-Life compilations, collectors would get cassette tapes of old radio shows from small companies that advertised in the back of magazines, or swapped them amongst themselves. My Dad had an entire bookshelf full of these cassettes. He would pick me up for our weekends together and inevitably, one of those cassettes was playing in the car. I heard Jack Benny, Burns & Allen, Bob & Ray and so many more. And I laughed. I didn't want to sometimes. Sometimes I wanted my square old Dad to put on some hip and happening Carpenter's music, but we listened to the late great comedians, and for that I am forever grateful. I also took great joy over the years when talking to other people of my dad's generation. More often than you might think I would hear them say, "You're probably too young to have heard of Fibber McGee." I would say, "Are you kidding? I've practically modeled my closet after his." Oh, how the jaws would drop. Number 2: Drove me to school. And not just any school. My last two years of high school were at a boarding school three hours away from home, and he drove me up and back from there for every major holiday, and for the start and end of each school year. Considering how much I loved going to Miss Hall's School, I loved him for dropping me off at those doors. And it wasn't just to Miss Hall's. He drove me to Syracuse University in a blizzard for my interview, and before MHS he drove me to some of the most remote places in New Hampshire to look at other boarding schools we were considering. One school had a two mile long, dirt driveway surrounded by pine trees. We pulled up to the small rustic buildings that made up the campus and he looked at me. "Do you want to go here?" he asked me. "I don't think so." I answered. "Good, because I don't want to have to drive through all this every winter." And the number one thing I love about my Dad: He's Uncle Grampa Cam. My son graduated from preschool last month. While standing up in front of the room, he pointed to my Dad and told the girl next to him, "That's my Uncle Grampa Cam." I love that he called my Dad that because that means that he's not just the guy who is his Grampa, he's his friend, just like all the other friends of our family he calls "uncle." My son adores his Grampa, and whenever my Dad comes up no matter what they are doing together, my son wants to hold Grampa's hand, show Grampa what he can do and tell Grampa about all the things that interest him. My son definitely got the gift of gab directly from my father, because my son also never meets a stranger. I love to see my two chatterboxes together, because I see so much of each of them in each other. And I look forward to many more years of eavesdropping on their lengthy, lengthy conversations. How About a Laugh Today? I was watching Last Comic Standing a few weeks ago and was blown away by the set of comedienne Jackie Kashian. When the episode of LCS was over I went searching for more information about Jackie. I discovered she has her own podcast, called The Dork Forest, where they discuss anything with which one can be obsessed. I haven't listened to it yet but I have subscribed to it. If any of you know me in reaal life, you can definitely attest to both my dorkiness and my ever increasing ability to obsess. So this one sounds right up my alley. I'll need at least a few days to figure out which obsession I should call in with first. Today is now this blogs birthday!! Coincidentally enough, tomorrow is also the birthday of two of my friends, Donna and Amy. Everybody say, "Happy Birthday, Donna and Amy!!" 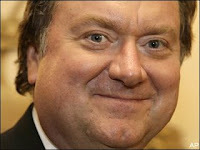 As I sat here trying to get this blog off the ground, I heard the news about the death of Tim Russert. I spent a few years being a real news geek. I had a job that involved a lot of driving and I preferred to turn the radio to the all-news or the all-talk stations, just to hear the voice of another human being. Since my son was born I have been a stay at home mom and my background noise is more likely to be Tom and Jerry sound effects or "Choo-Choo Soul" songs. Anyway, I always loved watching him work. He asked tough questions, but wasn't a jerk about it. I never felt like he was pressing people just so he could get a reputation as a "personality" but instead because it was his job to hold politicians accountable, unlike certain interviewers. *coughchrismatthewscough* And in all candid or informal interviews, like on the late-night talk shows, showed a pretty good sense of humor. The stories his colleagues are telling are very touching. He was devoted to his dad and son. Someone just said he used to make sure people came by to see his father, at least seven or eight visitors a day, by calling people and putting them on a schedule. Even when he was in Washington and his dad was in Buffalo. That's awesome. And you know he's pretty cool when it turns out his college-aged son put a tattoo on his side with his father's and grandfather's initials, just so those two men would always be by his side. Well done, Luke Russert. Some of you have read this many times before, but it just needs to be included here. The whole ordeal occurred in the summer of '07. So I kind of accidentally started potty training my son when he got yet another horrible diaper rash because he was withholding poops. I told him "Thats it, no diapers tomorrow (Friday) they are giving you these rashes" (They weren't, it was his own fault, but it was another desperate attempt on my part, and I was surprised when it worked) and after one early accident he did great all day Friday peeing, but never pooped. There was an ill timed block party we were invited to on Saturday, and we went, armed with his only 3 pairs of underwear and about 5 pairs of shorts. So, he of course peed on the sidewalk at one point because he never has these kinds of distractions anyway, much less when he's supposed to be remembering to use the potty. So that took out one pair of underwear. He then soiled the last two pairs trying to hold in a poop, which had been occurring a lot because of the aforementioned diaper rash. So, I was left with no choice but to send him out to the party in shorts "commando style" while we tried to get his underwear washed and dried. About a half an hour later we are sitting there and I see him go across the street and start his "holding-it-in" dance. I figure he's yet again sure to win this battle so I don't think much of it at first, but all of a sudden, he uncrosses his legs, does a little shimmy move and out of the leg of his shorts drops the biggest freakin' turd right out into the street. I don't know whether to laugh or scream, so i try to do both (doesn't work) and I tell(screech at) my husband to get a bag or something. There was no hope of keeping it a secret, either. If he had been the slightest bit freaked out by this I wouldn't be sharing it, but I guess he was just happy to be rid of it (remember, it had been since, I think Tuesday or Wednesday since he had gone!) and wasn't phased at all. Which is weird seeing as how 45 minutes earlier the idea of pooping at all, anywhere, was freaking him out. Anyway, I expect a day to come, perhaps his college graduation party or his wedding, where at least one guest will turn to me and say, "Hey, remember the time he crapped in the street?" In the weeks since The Incident... [side note: I have come to find out that the hosts of the party now use the phrase "parked the Kia" to describe Cameron's unfortunate on-street deposit. I find this a little offensive. This thing was at least a Camry!] Cameron has had his fair share of forgetfulness, some wet beds and a slew of almost-made-its, but I am happy to report that he is completely potty trained and has not had a single diaper rash since he decorated Ardale St. Personally, I'm pretty happy we let him take his time. We had considered quite a few methods when he was younger. There was one that was pretty much like housebreaking a puppy: confine him to the bathroom, pump him full of water and keep up a routine of taking him for a walk, er, um, putting him on the toilet at regular intervals, complete with praises and treats and belly rubs when he had success. I decided against that method because what the hell do you do between pee breaks? Scrabble? The redecoration that would have been necessary from him bouncing off the walls was a little out of our price range. The method of putting a sticker on a reward chart was an appealing one... for about a week. Complete a row and get a new toy! Who knew the bladder had magical powers? All the logic, threats and pleading to get a kid to give up a toy at the store, but face a kid with the question "don't you want to pee on the potty so you can get a new train?" and he suddenly becomes completely uninterested in the acquisition of material things. Like he turned into a monk overnight. We went with the "wait until he's ready" method. That way they practically train themselves. See, the amazing thing about a 3.75 year old boy is that he has finally discovered his peeper. The appeal of the potty comes best when they realize how much more handy it is to have that thing, well, at hand. No diapers covering it up, just letting it all hang out, balls in the wind freedom for the little buddy. That's when you can say "No more diapers" to them, and they will say "Thanks, Mom! Oh, and by the way, have you seen what I can do with it?" I have been wanting to start a blog here for some time but was waiting for I guess the perfect subject matter and/or joke to pop into my head to make it the awesomest blog post ever. Then I remember: I'm nowhere near talented enough for that. The best I can hope for is a slow steady stream of blogs that will hopefully get better as I go. It's like going to the bathroom at a party. You wait and wait, thinking about it but not feeling any great urge. But once you go, the trips get more frequent and much more necessary. Incidentally, I have a feeling the content here will be heavily influenced by alcohol as well.